Pergola on the Roof – Europe’s largest temporary pergola – has returned to the rooftop of Television Centre following two highly successful seasons last year. Once again the pop-up eatery is hosting four exciting restaurants and two bars in the 600-capacity venue, which has been completely redesigned and inspired by The Hamptons, the popular seaside escape for New Yorkers. Pergola on the Roof first launched last summer as a Mediterranean-inspired pergola before being transformed into a Nordic winter forest and welcomed over 140,000 guests throughout 2016. 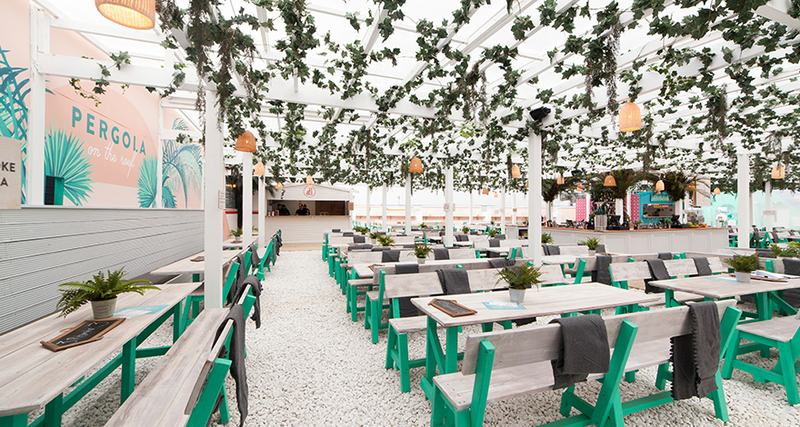 The new incarnation opens from 3 May until 1 October and brings a taste of Long Island living to west London with white-washed decking, palm trees and 13-person daybeds. The four restaurants lined up for this year’s event are Breddos Tacos, 8 Hoxton Square, Salt ‘n’ Sauce, and Patty & Bun.